Ondine offers their usual high standard of sonic quality: a complete absence of noise and distortion, perfect balance and equalization, and expansive dynamic range. 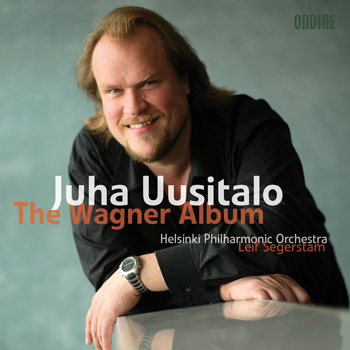 An album with the stamp of greatness (...) that mark (Juha Uusitalo) out as one of the most promising Wagner bass-baritones of the new generation. Uusitalo's bass-baritone is exceptional, a powerful, secure instrument blending a bright, heroic top with darkly resonant lower notes, ample stamina, clear diction, and committed (...) acting. Bass-baritone Juha Uusitalo's first aria album features the outstanding Finnish newcomer with the best-known arias for male voice from Wagner's operas, including the popular 'Song to the Evening Star' ("O du, mein holder Abendstern") from Tannhäuser. Juha Uusitalo is accompanied by the Helsinki Philharmonic Orchestra under the direction of its Emeritus Chief Conductor Leif Segerstam. Described by the Financial Times in July 2007 as, "a titan of a Macbeth, with a huge yet cultivated sound and truck-loads of charisma set to conquer the opera world," Juha Uusitalo first started a career as a professional flautist, before turning to singing and rocketing to international status in a remarkably short period. Wagner’s Flying Dutchman has become a signature role in his repertory, since Juha Uusitalo gave his début in this role in Savonlinna, Milan, Vienna and Munich. In autumn 2007, he sang Wotan at the Vienna Staatsoper in several acclaimed performances. Under the direction of Franz Welser-Moest, he will star in the complete Ring cycle through 2009. In October 2008, Juha Uusitalo will give his début at the New York Metropolitan Opera as Jochanaan in Richard Strauss's Salome, as partner of Karita Mattila (Salome) and under the direction of Mikko Franck.